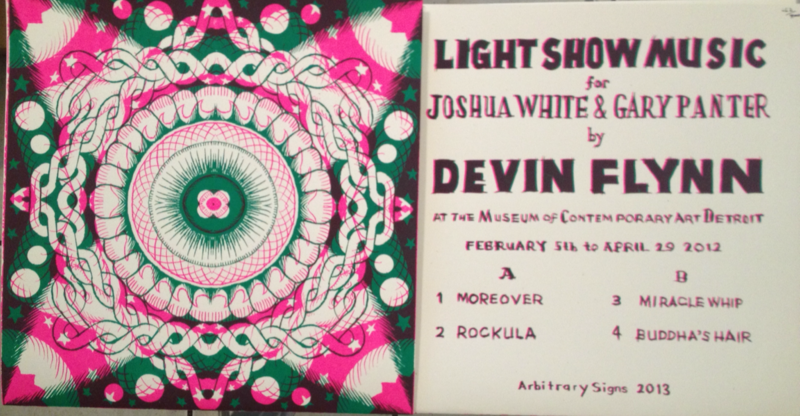 "A psychedelic melange of acid guitar jams and cartoon music for the Joshua White/ Gary Panter exhibition at the Museum of Contemporary Art Detroit." - Arbitrary Signs. Packaged in 2 color screened sleeves with art by Gary Panter and a 4 page foldout insert with art and an interview with Joshua White and Gary Panter. Marcia Bassett (Double Leopards, Hototogisu, Shakamaxon, etc..), Pete Nolan (Magic MArkers,etc..) and Steve Gunn. "New lineup featuring John Truscinski of X04 on percussion. Ts nimble shuffling opens up trad GHQ sounds into new realms of freeedom and weightlessness. Also includes some new loose song-based material. Guaranteed head music." - Arbitrary Signs. Recorded live at the Rare Book Room in Brooklyn, NY by Samara Lubelski (Hall Of Fame). Free psych/punk jams from Leah Quimby (bass), Elisa Ambrogio (guitar and vocals), and Pete Nolan (drums). Packaged in silkscreened, duct taped cardboard jacket. LP soon on Ecstatic Peace. "Super quality recording of a great I trust my guitar era Magik Markers show in Baltimore back in 2003. The early band were in full effect here, creating tight organic instant no wave compositions each night out of naive guitar, rocking/shambling beats, screams and whatever happened to be going through Elisa Ambrogios mind each night. This is a really cohesive show and it kind of sets the record straight about what the early Markers actually sounded like. The banters on point too. Cool document" - Arbitrary Signs. "When confronted with an example of magnificence in nature, such as a waterfall, Jane Goodall reported that the chimpanzees she observed were captivated, as if in awe of the beauty of the world. On BOSS, the Magik Markers have tried to capture the chimps awe. A formality and restraint the Markers have never exerted on their previously recorded material is present on BOSS. Now the Markers are Jainists, with their mouths masked so as to not inhale even one tiny insect, here pursuing the killer gentle with a vengeance. Recorded in the cavernous dark of Echo Canyon West, with producer Lee Ranaldo working the boards like a diviner, BOSS documents the Markers with a previously unheard fidelity and orchestration. Idiosyncratic song structure and melodies interspersed with a destructive drum stomp are reminiscent of the early electrified blues of Junior Kimbrough, or the black hole rhythms of Kousokuya. Mixing a gentle vulnerability with a winded egomania, the Markers have always had a musical tunnel vision; BOSS is that vision made manifest. The tug of war the Markers enact, the way they are fully prepared to start yanking their world apart as they find themselves losing their place in, makes moot possibilities of greatness or mediocrity. It makes them unapologetic soothsayers with their ears pressed to the ground, waiting for footsteps. With Peter Nolan, we finally hear what Lou Reed would have sounded like had he sallied with the drums instead of getting seduced by the easy praise of front man status. Like Rashid Ali squeezed into the Teutonic leather pants of Faust, Nolan drums like there are hell hounds at his heels but he just cant be bothered. Here both laconic and frenzied, Nolans drumming arms reach out like an octopus: tickling the ivories, humming the organ and blasting taps on some kind of endtime trumpet. As a pianist, Nolan reminds us that the piano is a percussive, beating out the whoomp of some old war dance, a bare foot-fall rhythm of fighters to battle and the heavy hands of a whiskey burlesque in the afternoon. Nolan is easy to underestimate, but finally, here is high fidelity record of the strange soul of one of Americas most natural and quizzical musical minds." -Ecstatic Peace. Vinyl issue of the EP CD. Small repress - handpainted jackets, insert, full color poster. "An unmade LP produced by Mark Ospovot at Imandi Studio, Brooklyn." "Arbitrary Signs is turbo stoked to announce the August 1st release of "Liberty Rose" the brand new lp by contemporary psychic blues visionaries MV & EE. The duo spent 40 days and 40 nights under the twisted trees and endless sky of the Mojave desert via a Vermont homestead, freedom and unity. Thats where thesesongs were unformed in dreams, floating off to mingle with the collective unconscious of coyotes and rattlesnakes, before they were re-birthed as smoke signals channeled through shaky hands, an old tele, germanium transistors and a bucket brigade. We at Arbitrary Signs feel that this is the purest distillation of the MV & EE " S P E C T R A S O U N D " to date. Embedded within the grooves of this record are 6 streams to dip into as respite from the punishing rays of the hot summer sun." - Arbitrary Signs. Pete of Magik Markers. "Ex-angel - fuzz up - GPRO Blankest Meds." "This CDR explores new sonic possibilities of home 16 track technology and early formation of the new band phase of Spectre Folk as Pete is joined by J.T. Sodas on synth. A few songs, new and old, are given the Band treatment. Thers also some very glopy stuff and some extendo blooz stuff, as well as some solo synth action. A long disc full of dripping mind exploration.." - Arbitrary Signs. "In the Sparkin Age of the Great White Horse" is the new cassette from Spectre Folk, nearly 50 minutes of psych-ish folk-leaning rock fog that is destined to melt into your dashboard this summer The tracks are culled and clipped from the sessions that produced Spectre Folks most recent LP, Compass, Blanket, Lantern, Mojo. Here in the sparking age, Pete Nolans mood seems, lighter and brighter – theres less mystic nursery hush and a much more saturated stain of the pink-orange ice cream colors of a Pacific sunset. True to form, there are forlorn fingerpickers and some quiet, noisy stretches that feel like a walk alone in the woods at night, but the tape also finds Nolan making organic noises with his noisemaking machinery: a tube amp makes thundercloud sounds on a track thats got the hazy warmth of a summer day begging for a rainshower; synths burble, ominously at first, then dissolve into the a sound like passing cars on the highway, before a couple guitars, intertwined, come in at a glacial gallop marching the tape along. And the albums rockers show Nolans increasing comfort with extended form guitar solos that saunter into and out of wild crescendos and murky valleys like its the easiest, most natural thing in the world for the music to do." - Arbitrary Signs.